Ok, its been a while since I posted anything new, so here I go…. 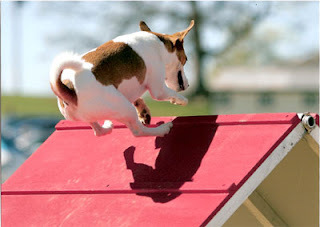 Now that spring is upon us, Dasher and I have been going to lots of agility shows. He has been doing great. Fortunately I have not been screwing him up too much these days although I must say my learning curve is much steeper than Dasher’s!! Luckily he is very forgiving!! I decided we would pretty much show strictly USDAA shows from now on, I would like to stay focused on one venue and I think they are more fun anyway!! 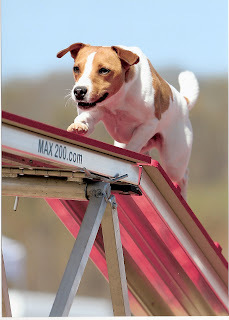 We earned our Agility Dog title a few weeks back at the Mid-Atlantic MADness show and now we are showing at the Advanced level. These pictures are from the Ruff Riders show at Morven Park 2 weekends ago. He did really great. The pictures were taken by M.Nicole Fischer Photography, she takes really great pictures!! This first one I thought was cute, none of his feet are touching the frame, he is really flying!! He looks very focused in this one….